The new battery-operated Boomer M2C Battery driller being offered by Atlas Copco was on display at the shop in Lively on Wednesday as the company officially launched their full suite of battery-powered mining vehicles, which shop manager Jean Labelle says will cut down of emissions, diesel fumes and even time lost to refuel vehicles and hauling fuel underground. On the left is an Atlas Copco ST7 scooptram fueled by diesel, on the right is the new ST7 battery-powered loader, showing the similarity in size and design, the major difference, said shop manager Jean Labelle is the 6,000-tonne battery, which he says does not change the overall performance or loading capabilities of the machine. It was one of many new battery-powered machines on display at the shop on Wednesday, which product manager boomer in Sweden Johan Jonnson said gives the company a full suite of mining vehicles, covering everything from blasting, bolting, mucking and hauling. Battery-powered vehicles are taking over underground mining. To meet current demands for cleaner technology and to stay ahead of the innovation curve, Atlas Copco has created an entire suite of battery-powered vehicles, covering the process from bolting, blasting, mucking and hauling. 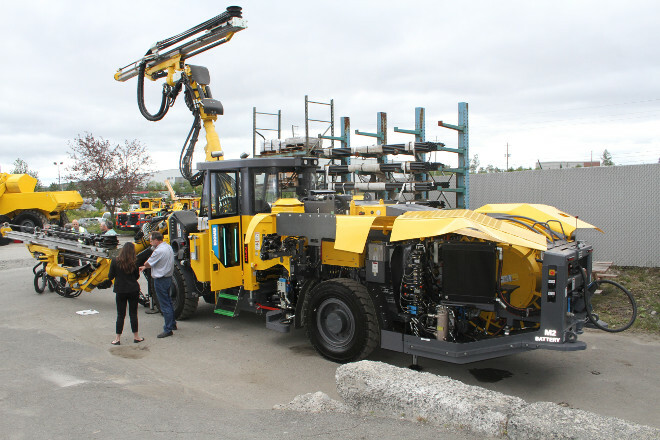 They added to their ever-growing fleet with the launch of the Boomer M2C Battery driller on Aug. 2 in Sudbury [.ca] to complements their fleet that includes Minetruck MT42, Scooptram ST1030, Boomer 282 and Aramine L150 miniloader, which were also showcased at the event. “Mining is coming back and as a company, we have to stay ahead of the innovation and meet demands,” said general manager Jason Smith. All the battery vehicles were on display for all to see outside the shop in Lively. Shop manager Jean Labelle and others were giving visitors a tour of the new machines, touting their features as cost-effective, safe and much cleaner than diesel. Fumes underground, Labelle said, have been a problem plaguing the mining industry for decades and eliminating diesel altogether would cut down the hazards significantly, as well as save time and money on refueling. “Miners had to deal with breathing in fumes in the tunnels, that caused all sorts of problems, short-term and long-term, to their health and productivity,” he said. Johan Josson, product manager boomer for Atlas Copco in Sweden said with zero emissions coming from these new machines, ventilation in the mines will be much cleaner and safer for the miners,” he said. While the batteries are removable, they are not interchangeable. Josson explained they are different sizes for each model, but inside they have identical cells and components. As well, different models, like the Boomer M2C and ST7 have different power needs. The ST7, he explained, can have the battery removed at a service bay and a fresh one put on while the old battery recharges. The Boomer M2C, since it is always connected by a power cable, will use some of the power to charge continuously as it works at the rock face. Battery technology, he said, is the future of mining. Diesel is falling out of favour in underground operations. The industry is pushing to get away from it because no one wants diesel engines underground anymore. According to a statement from the company, to convert a Scooptram ST7 diesel to battery would be possible by exchanging the rear end frame and components, eg centre hinge and back. The front end is the same. The Boomer is not so easy as the battery driveline is built on the company's latest carrier with many optimized design features. So applying those changes on an older carrier is timely and costly and would suggest purchasing a complete machine and discuss options with customers. To combat overheating, a common problem in industrial batteries, Atlas Copco installed several safeguards, including individual cell heat monitoring during charging, battery temperature sensors during work and internal fire suppression and automatic shut-off in case of overheating or fire. The vehicles themselves are almost the exact size and design as the diesel models. 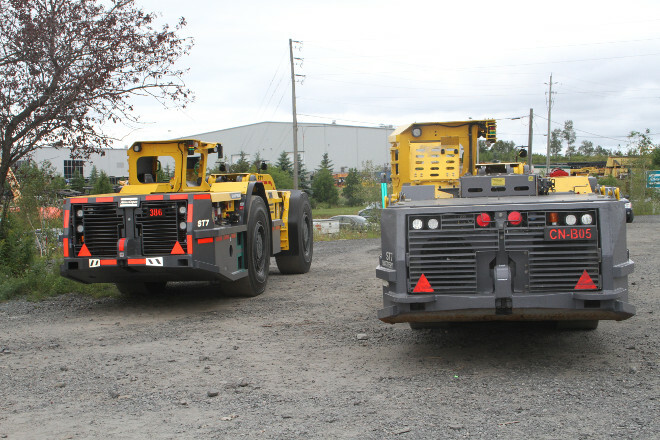 For comparison, the diesel and electric models for the ST7 underground loader were parked side-by-side. Labelle said the electric version is only a few inches longer. The battery pack for it weighs about 6,000 pounds, but the design of the vehicle makes up for the extra weight so it does not undercut the performance. “Batteries are like laptops, they are getting better, stronger and smaller every year. These machines are more expensive at first, but really it's paying up front for the future costs,” he said. The old diesel models had to stop, refuel, take time off for maintenance. These machines are much more efficient, there's no need to purchase, store and run fuel underground. The electric cables needed to charge these last for years and need to be buried only once. The unveiling was also an opportunity for the company to update the public on their plans to split into two corporations. Last January, the company decided to diversify by splitting into two subsidiaries: Atlas Copco, which will concentrate on industrial, and Epiroc, which will focus on mining, civil and natural resources. Epiroc will officially debut early next year. In the future, Atlas Copco in Lively will become Epiroc, but the only thing changing will be the name. “We will keep all our employees, nothing changes, this is to help our corporation expand and diversify,” he explained.